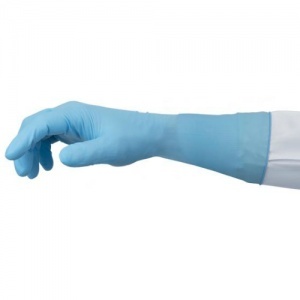 The Ansell TouchNTuff 93-263 Disposable Long-Cuffed Nitrile Gloves are manufactured from a nitrile formulation to provide flexibility for maximum dexterity and reduced hand fatigue. Featuring an extra-length cuff, these gloves provide splash-proof protection against a number of chemicals, making them suitable for a wide range of applications, from spray-painting to laboratory analysis. The Ansell TouchNTuff 93-263 Gloves are available in a choice of sizes, making them suitable for most users. Please consult the table below for details, then select the required size from the drop-down menu at the top of the page. The gloves have a thickness of 0.17mm and a length of 355mm. Please note that these gloves are supplied in a box containing 50 ambidextrous gloves.